ROCK: Paleontologists have been discovering and describing many middle Cambrian creatures from the Stanley Glacier exposure of the Stephen Formation ever since 1996, when a German hiker discovered fossils on the trail in Canada's Kootenay National Park. PAPER: Scientist David Legg of Imperial College London details one of the 505-million-year-old fossils in this month's issue of The Journal of Paleontology. 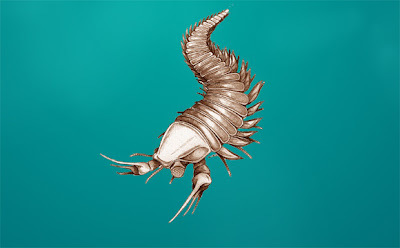 The 1.5" (4 cm) creature is a distant ancestor of lobsters, crabs, spiders, centipedes, millipedes, and scorpions. It used its many legs to scuttle along the seafloor and its compound eyes, located on stalks on top of its head, to search for prey hiding in the sediment. this is very interesting!!! thanks!